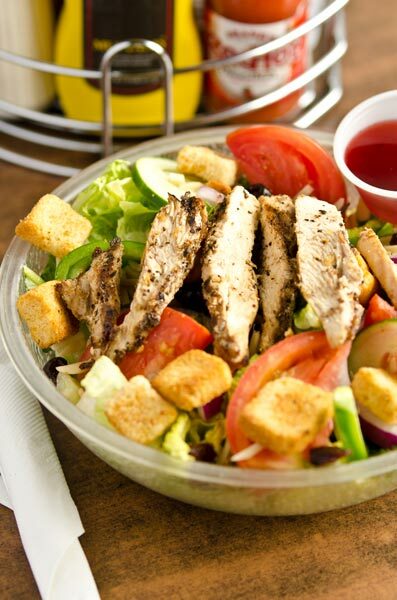 Romaine lettuce, tomato, red onion, cheese, and croutons with your choice of dressing. Romaine lettuce, tomato, red onion, and croutons. Topped with shredded Parmesan and Caesar dressing. Romaine lettuce, red onion, cucumber, green pepper, tomatoes, croutons, and topped with cheese. Deep fried chicken strips, served over romaine lettuce, red onion, cucumber, green pepper tomatoes, croutons, and topped with cheese. Dried cherries and almonds served over romaine lettuce, red onion, cucumber, green pepper, tomatoes, and croutons. Romaine lettuce, tomato, red onion, corn salsa, avocado, tortilla strips, and ranch dressing.